A satellite view of the Alps. The Alps  is the greatest mountain range of Europe. It reaches from Austria and Slovenia in the east; through Italy, Switzerland, Liechtenstein and Germany; to France in the west. The original meaning of the word was 'white'. The highest mountain in the Alps is Mont Blanc, at 4,808 metres (15,774 ft), on the Italian–French border. How the Alps were made. The Alps stretch from Austria and Slovenia in the east, through Italy, Switzerland, Liechtenstein and Germany to France in the west. The mountains are divided into the Western Alps and the Eastern Alps. The division is along the line between Lake Constance and Lake Como, following the Rhine. The Western Alps are higher, but their central chain is shorter and curved; they are located in Italy, France and Switzerland. The Eastern Alps (main ridge system elongated and broad) belong to Austria, Germany, Italy, Liechtenstein, Slovenia and Switzerland. The highest peaks of the Western Alps are Mont Blanc, 4,808 metres (15,774 ft), Mont Blanc de Courmayeur 4,748 metres (15,577 ft), the Dufourspitze 4,634 metres (15,203 ft) and the other summits of the Monte Rosa group, and the Dom, 4,545 metres (14,911 ft). The highest peak in the Eastern Alps is Piz Bernina, 4,049 metres (13,284 ft). Perhaps the most famous location for tourist to the Alps are the Swiss Alps. The main chain of the Alps follows the watershed from the Mediterranean Sea to the Wienerwald, defining the northern border of Italy. It then passes over many of the highest and most famous peaks in the Alps. From the Colle di Cadibona to Col de Tende it runs to the west before turning to the northwest and then, to the north, near the Colle della Maddalena. Upon reaching the Swiss border, the line of the main chain goes about northeast, a heading it follows until its end near Vienna. The Alps do not make an impassable block; they have been traveled by for war and commerce, and later by pilgrims, students and tourists. Mountain passes give paths between mountains, for road, train or foot traffic. Some are famous, being used for thousands of years. The Union Internationale des Associations d'Alpinisme (UIAA) has defined a list of 82 "official" Alpine 4,000-meter (13,123 ft) peaks. The list has many sub-peaks with little prominence, but good for mountaineering. Here are the twelve four-thousanders with at least 1 km prominence. Karl Blodig was the first person to climb all the main four-thousand meter peaks, round 1900. The reason mountains form is usually the moving together of continental plates of the Earth's crust. The Alps rose as a result of the slow but gigantic pressure of the African plate as it moved north against the stable Eurasian landmass. In particular, Italy (which had been a separate island) got pushed into Europe. This all took place in the Tertiary period, mostly in the Miocene and Pliocene. That's about 35 to 5 million years ago. The Alps are just a part of a larger orogenic belt of mountain chains, called the Alpide belt. It reaches through southern Europe and Asia from the Atlantic Ocean most of the way to the Himalayas. A gap in these mountain chains in central Europe separates the Alps from the Carpathians off to the east. Subsidence is the cause of the gaps in between. A great and ancient ocean was once between Africa and Europe, the Tethys Ocean. Now sediments of the Tethys Ocean basin and its Mesozoic and early Cenozoic strata sit high above sea level. Even metamorphic basement rocks are found high on Mont Blanc, the Matterhorn, and other high peaks in the Pennine Alps and Hohe Tauern. The formation of the Mediterranean Sea is a more recent development. The Alps are popular both in summer and in winter. The Alps as a place for sightseeing and sports. Winter sports (Alpine and Nordic skiing, snowboarding, tobogganing, snowshoeing, ski tours) can be learned in most regions from December to April. In summer, the Alps are popular with hikers, mountain bikers, paragliders, and mountaineers. There are also alpine lakes which attract swimmers, sailors and surfers. The lower places and bigger towns of the Alps are well served by motorways and main roads, but higher passes and by-roads can be bad even in the summer. Many passes are closed in winter. Many airports around the Alps (and some within), as well as long-distance rail links from all bordering countries, afford large numbers of travelers easy access from abroad. The Alps normally has more than 100 million visitors a year. The Alps is split into five climate zones, each with a different kind of environment. The climate, plant life and animal life vary on different sections or zones of the mountain. The section of the Alps that is above 3,000 metres is called the névé zone. This area, which has the coldest climate, is permanently coated with compressed snow. Plants are therefore scarce in the névé zone. The alpine zone lies between the height of 2,000 and 3,000 metres. This zone is less cold than in the névé zone. Wildflowers and grasses grow here. Just below the alpine zone is the subalpine zone, 1,500 to 2,000 metres high. Forests of fir trees and spruce trees grow in the subalpine zone as the temperature slowly goes up. At about 1,000 to 1,500 metres high is the arable zone. Millions of oak trees sprout in this area. This is also where farming takes place. Below 1,000 metres are the lowlands. Here, a larger variety of plants are produced. Aside from plants, villages are also in the lowlands because the temperature is easier for humans and farm animals. The Alps is a classic example of what happens when a temperate area at lower altitude gives way to higher land. A rise from sea level into the upper regions causes the temperature to decrease. The effect of mountain chains on winds is to carry warm air belonging to the lower region into an upper zone, where it expands and loses heat, and drops snow or rain. The typical trees—oak, beech, ash and sycamore maple have a natural height limit: the 'tree line'. Their upper limit matches the change in climate which comes with increasing height. The change from a temperate to a colder climate is also shown true by a change in the wild flowering plant life. This limit normally lies about 1,200 metres (3,940 ft) above the sea on the north side of the Alps. On the southern slopes, it often reaches to 1,500 metres (4,920 ft), sometimes even to 1,700 metres (5,580 ft). The Alps do not always have the typical trees. People have felled them in many places. Except for the beech forests of the Austrian Alps, forests of the typical deciduous trees are hardly found. Where such woods were, Scots pine and Norway spruce now grow. These trees are less sensitive to the attacks of goats who eat the saplings of deciduous trees. Above the tree line, there is often a band of dwarf pine trees (Pinus mugo), which is taking place of dwarf shrubs. These shrubs are Rhododendron ferrugineum (on acid soils) or Rhododendron hirsutum (on non-acid soils). Above this is the alpine meadow. Above the alpine meadow is where plant life becomes less and less common. At these great heights, the plants are likely to make separate groups. In the Alps, many species of flowering plants have been recorded above 4,000 metres (13,120 ft). These are like Ranunculus glacialis, Androsace alpina and Saxifraga biflora. Species common to the Alps. Wikimedia Commons has media related to Alps. ↑ The English name Alps was taken from French from Latin Alpes, which may be ultimately alike with Latin albus ("white"). 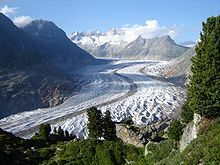 The German Albe, Alpe or Alp (f., Old High German alpâ, plural alpûn), and the French Alpage or Alpe in the singular mean "alpine pasture", and only in the plural may also refer to the mountain range as a whole. This page was last changed on 2 April 2019, at 03:50.